At this year’s WWDC, Apple devoted a lot of onstage attention to a revamp of the Notes app in both iOS 9 and OS X El Capitan. One of my favorite additions is inline web link previews. Just paste a URL, and Notes will turn the link into a preview bubble with a thumbnail for the page, as well as a title and description. This got me thinking about the possibility of applying the same functionality to other apps. The most obvious place to start, in my opinion, is Messages. I’m constantly sending and receiving links through iMessage throughout the day, whether it’s to a web page, an image, or even just a tweet. Having to flip back and forth between Safari and Messages just to see what the link I’ve been sent is removes me from the conversation and slows down my workflow. This problem has been partially solved by applications such as HipChat, which I’ve been using for years. Just paste in a link to a tweet, and you can read the tweet inline with the rest of the messages in the chat room. No need to click or tap on anything. After using HipChat, links in Messages feel like a step backwards. However, HipChat has its limits, both in terms of functionality and design, and I think that Messages on both iOS and OS X could take this concept of inline previews to the next level. Let’s take a closer look. The state of document and link previews in Messages today. If you’re familiar with the Finder in OS X, you’ve likely used Quick Look before. Select just about any file and hit the space bar, and you’ll see a preview of it. 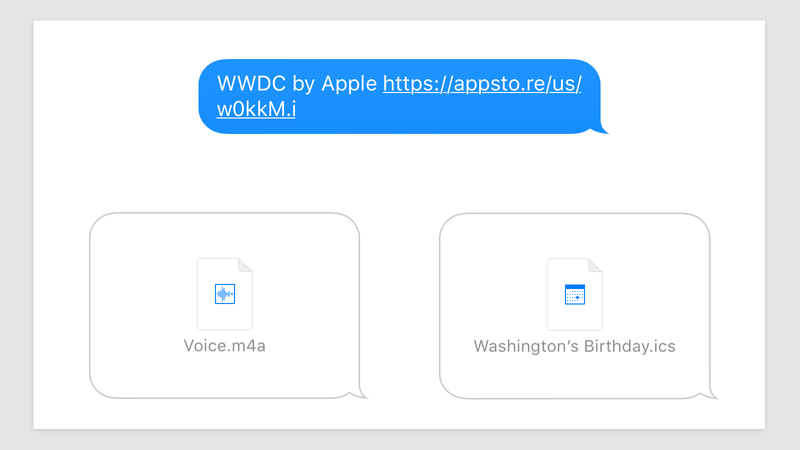 Apple has integrated a feature by the same name into iOS, but its functionality is much more rudimentary, showing little more than the file name and application icon for a file sent across Messages. Right now, the only exceptions to this rule are when someone shares their location with you in Messages, or you receive a contact, both of which show detailed previews. Click any mockup for a larger preview. Applying this same basic principle to Messages has immediately obvious benefits. An inline website preview, image, or tweet informs you of what you’re going to see before you even tap the link, if you need to at all. Going further, links to YouTube videos could show the video thumbnail as well as the video title inline. Even links to iTunes Store content could be enhanced, showing a thumbnail and title right in Messages, or the album art and a preview button for a song from Apple Music. There are uses for these inline previews beyond entertainment, too. Want to invite someone to an event? Forget sending an email, just message them the invitation and they can accept without leaving the app. iWork and Microsoft Office documents could show document previews and filenames without tapping. Voice Memos could play right in your conversation, just like iMessage audio messages. If you’ve ever tried to share a note from the Notes app with someone over iMessage, you’ll know that right now, the contents of your note just get dumped into one long, scrolling box of text, with questionable formatting. Notes with inline previews could show the title and first few lines, offering to expand out to the full, properly formatted version with a tap. Often times I find myself wanting to share the current weather with someone over iMessage who doesn’t live nearby, but right now the only simple way to do that is to take a screenshot of your weather app and send it over. Inline weather previews would allow you to hit a simple share button in the Weather app and send what could almost be described as a little weather “widget” to someone else. Last, but not least, who couldn’t use a little motivation now and then? Sharing your Apple Watch’s activity rings with someone else might just provide you that little bit of motivation you need to fill your exercise ring… or you could just brag once you have. One of the best parts of these inline previews is that they aren’t limited just to the Messages app. The same previews could work in other Apple apps like Mail and Notes, or even in third party apps that support document-style text input. A feature like this, while subtle in implementation, has the potential to save a significant amount of time and remove points of friction in anyone’s workflow.